I started reading from the last page, where the graphic humor and the occasional caricature of a famous person appeared. I then turned to the crossword puzzle and when I reached the articles, I started to fear that my reading would soon end. I would have to wait another seven days for the seller to shout its name under our windows, a name with distant connotations in pages smelling of ink. My grandparents sought to curb my enthusiasm, saying that the weekly magazine, which they used to buy at the kiosks, was a shadow of its former self. 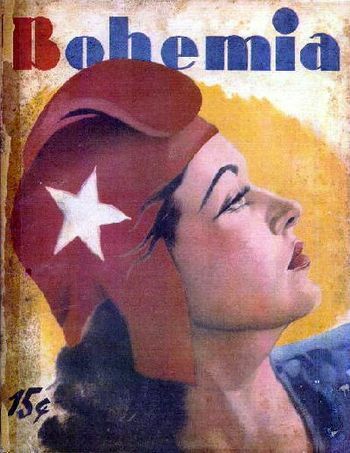 Bohemia, the oldest magazine in Cuba and in Latin America, was born in 1908 and now it's the living dead. Though it continues to pile on the years, the fact is that for more than a decade it has ceased to be a reference point. The 1959 Bohemia of Freedom issue, where they showed the bodies massacred by the previous dictator, has been replaced by a boring, triumphalist, insignificant publication. It shrank and lost pages. Its articles repeated the same old sugary stories as the rest of the official press. Even its cover could be confused with those of other magazines, like Sea and Fisheries or the prudish, We're Young. Its whole personality slipped down the drain of censorship as it was re-educated by a system that doesn't like uncomfortable magazines nor incisive journalists. Every day I walk near the building that houses Bohemia, home to the most beautiful of all the busts of José Martí I've seen in Havana. I try to explain to my son that dozing there is one of the most important journals once enjoyed in this country and the entire region. For those of his age, that area near the council of state is simply a place where water collects when it rains, a natural pond that blocks the passage of cars after a shower. "Bohemia Lagoon," they call it, but I explain that before being known for its floods, in that site beat the heart of the press; there they prepared the pages for eyes like mine to enjoy.